Star Tours launched the new "Star Wars Episode VIII" sequence on November 17th as planned. The structure of the ride experience has remained the same with new updates in several of the sequences. Your Adventure Starts with either an updated sequence with the probe droid or a new sequence featuring Kylo Ren. The transmission to your starspeeder features a message from BB-8, Poe Dameron or Maz Kanata. After receiving the transmission, your adventure continues to the new Episode VIII sequence centered the planet Crait. 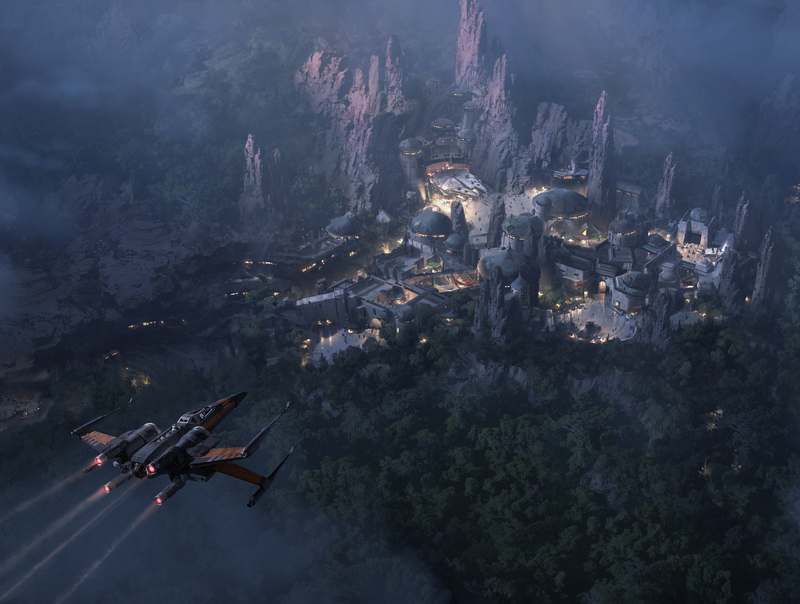 Your adventure concludes on the planet Batuu--the new planet created for the Star Wars: The Galaxy's Edge land. Disney's Hollywood Studios has announced that the new Episode VIII sequence for the Star Tours attraction will debut November 17, 2017. Walt Disney Imagineering has announced the destination of the new adventure to be added to Star Tours to celebrate Episode VIII. It was announced that the attraction will journey to the planet Crait from the upcoming movie. Trailers for the film has shown a battle taking place on this planet, however; it was not confirmed if the Theme Park attraction will take Guests into the middle of this battle or somewhere else on the planet. During a D23: Destination D presentation today, Walt Disney Parks & Resorts Chairman Bob Chapek also shared that – for the first time – we are adding a new adventure to the Star Tours – the Adventure Continues attraction. Walt Disney Imagineering and Lucasfilm teams are currently in production to add an exciting new mission to the attraction based on elements from Star Wars Episode VIII. It is implied that these additions will be more expansive than the characters & sequences added for Episode VII. Although no specific date was announced, it can be expected to be near the December 15, 2017 theatrical release of the film. As you can see, the land will take on a whole new dimension after dark and feature adventures and surprises around each corner. Click here for a larger version of the image above. If you look close, the image reveals a peek at what you’ll discover in this all-new land located in the southwest corner of Disney’s Hollywood Studios, including one of the signature attractions that lets you take the controls of the Millennium Falcon. This is really one of my favorite rehabs ever. I love that they are keeping it fresh with new missions. Concept art for the land at night looks amazing. Someday we'll find it, the rainbow connection, the lovers, the dreamers, and me. I wish they would have done something like this with the new Soarin' to make it interchangeable and update-able. Just realized that you posted a reveal date for this. We have FP+ for ST on the 18th, am I going to get to see this or will it be random? Can I ask a CM to see this version? This is awesome...but again see the note above. That hasn't been made completely clear yet, although there are now Rumours that the Adventures are going to be less varying starting sometime in 2018 changing to two distinct adventures with still some variations in each one. No, my understanding is that the "loading crew" has no control on the course of your Adventure. Got to see the new version on Saturday and it was great. From what I was told, everyone will be seeing the new sequence regardless of which cabin you travel in. The randomization and talk of Old versus New segregation will not take place until after the new year and I'm assuming once the "newness" of the current sequence has sunken in. All in all a very well done update. Although my one criticism/suggestion would be to add a different droid from the ST to the opening with C3PO (you will understand once you see it).